Aspose.Pdf.Kit is a .NET component to edit existing PDFs supporting window forms and ASP.NET applications. You can add/remove digital signatures or encrypt/decrypt a PDF. 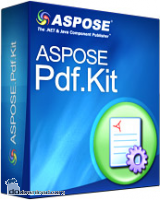 Aspose.Pdf.Kit for .NET supports XFA, adding CJK font in form field, bookmarks, PDF stamp creation, AcroForm, adding watermark or logo, extracting or adding images & text, append pages and converting PDF file to TIFF, BMP, PNG & JPG image formats. ...... providing functions to update and manage PDF documents. Aspose.Pdf.Kit for .NET offers developers the ability to manipulate pre-existing PDF documents. Aspose.Pdf.Kit for .NET allows you to concatenate or merge two or more PDF documents, Append new pages to an existing PDF file, extract pages, insert pages at a particular location in an existing PDF file, Split one PDF into two or more PDF documents. Create N-Up's (number of pages over single page) and create Booklets. Aspose.Pdf.Kit for .NET offers the capability to add XMP Metadata information such as CreateDate, CreatorTool, ModifyDate and MetaDataDate to PDF documents. Aspose.Pdf.Kit for .NET also allows developers to change Meta information like Title, Author Name, Header, Keywords, Subject etc. Qweas is providing links to Aspose.Pdf.Kit for .NET 5.5.0 as a courtesy, and makes no representations regarding Aspose.Pdf.Kit for .NET or any other applications or any information related thereto. Any questions, complaints or claims regarding this application Aspose.Pdf.Kit for .NET 5.5.0 must be directed to the appropriate software vendor. You may click the publisher link of Aspose.Pdf.Kit for .NET on the top of this page to get more details about the vendor.